Hamentaschen and Groggers for sale. Buy online at Zingerman's Mail Order. Gourmet Gifts. Food Gifts. Purim is quick little late-winter Jewish holiday that celebrates the defeat of Haman, a Persian leader who wanted all the Jews dead because their leader, Mordechai, wouldn’t bow to him. But Esther, who married the Persian King, convinced the king to kill Haman and make Mordechai the second in command of the kingdom. 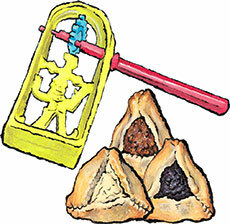 Haman wore a three cornered hat, and the traditional pastry for Purim, hamentaschen, is made to look like it. Kids like the holiday because they get to play with noisemakers called groggers. They make a racket whenever Haman’s name is mentioned, which is best done while eating a delicious pastry like cream cheese filled Hamentaschen. While we make and sell hamentaschen year-round, it’s traditional to eat them during Purim. Celebrate with a box of twelve hamentaschen featuring three flavors: four each of vanilla bean fresh cream cheese, poppy seed, and Northern Italian apricot. Don't care about the groggers? We sell the hamentaschen without 'em, too. "You may or may not know how useful the groggers are. When I was a kid, back in the 1950s, they gave them out in synagogue. When my own kids were kids, back in the 1980s, I think I used to buy them. Now when my grandchildren are young, they don't give them out, they're not readily available for purchase, and most of the ones on-line come with warnings that their sharp metal can cut little fingers. You don't send that dangerous metal kind. Thanks for everything."